BOWIE, Md. -- The Bowie Baysox and the Baltimore Orioles announced Thursday the Baysox coaching staff for the 2014 season. Baltimore native Gary Kendall returns for his fourth season as manager and is joined by hitting coach Butch Davis and pitching coach Blaine Beatty, who were both with the team last season. Kendall becomes the first manager in franchise history to return for a fourth season with the team as he begins his 15th season in the Orioles organization. In three seasons at the Baysox helm, Kendall has a 221-201 record and has led the team to the playoffs in 2012.The skipper is also coming off an Arizona Fall League Championship, where he managed the Surprise Saguaros this past fall. Prior to joining the Baysox, Kendall spent three seasons managing the Class A Short-Season Aberdeen IronBirds. Kendall began his coaching career with the Orioles as the field coach for the Rookie-level Bluefield Orioles (2000-2001) and the IronBirds (2002-2003) before making his managerial debut with Bluefield in 2004. After that season he spent three years as the manager for the Class A Delmarva Shorebirds (2005-2007). Kendall graduated from Sparrows Point High School in Baltimore and played at the Community College of Baltimore and Atlantic Christian College. Davis returns for his second straight season as Baysox hitting coach after spending the previous seven seasons as the Orioles' roving outfield and bunting instructor. 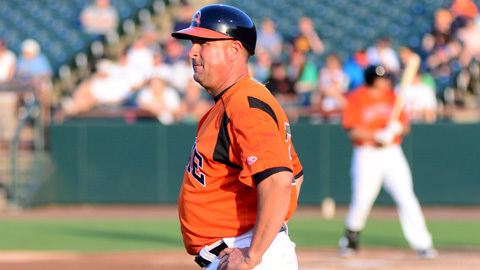 Davis is in his third stint as hitting coach for the Baysox, as he served in the same role in 2000 and from 2003-05. Prior to his time coaching the Baysox, Davis spent two seasons as a coach with the Rochester Red Wings (2001-02) and was the manager at Delmarva (1999) and the Gulf Coast League (1997-98). Upon joining the Orioles organization as a coach in 1995, Davis spent his first two seasons as a coach in Rochester. Originally drafted by the Kansas City Royals in the 10th round of the 1980 Draft, Davis spent 13 seasons in the Minor Leagues and played parts of eight seasons at the Major League level. Beatty returns to the Baysox for his second season as pitching coach after spending the previous three seasons in the same position with the Class A Advanced Frederick Keys. Entering his ninth season in the Orioles organization, Beatty served as pitching coach with the Keys for six years, while also spending the 2009 season with the Shorebirds. Prior to joining the Orioles, Beatty spent nine years coaching in the Pittsburgh Pirates and New York Mets organizations. Originally drafted by the Orioles in 1986, Beatty spent 12 seasons in the Minor Leagues, going 121-69 with a 3.26 ERA in 296 games. Baysox Baseball - We'll Knock Your 'Sox Off. The Baysox open the 2014 season, their 22nd as the class Double-A Affiliate of the Baltimore Orioles, at Prince George's Stadium Thursday, April 3. To keep up with Baysox news during the offseason, visit baysox.com.